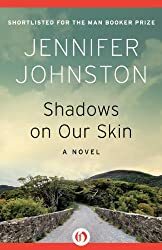 Shadows on Our Skin by Jennifer Johnston has recently been re-issued as an e-book. It was first published in 1977 when it was shortlisted for the Booker Prize. I was pleased to be offered a copy for review as I have enjoyed a few of her books, such as The Illusionist and Two Moons. This is the story of Joe, living in Derry (Londonderry), Northern Ireland before the Troubles and the Bloody Sunday attack in 1972. Joe is a schoolboy, living with his mother and his alcoholic father, a former war hero who reminisces and feeds on his memories. It’s a violent situation at home, as the father dominates his wife and son, with an even more violent conflict in the streets. To a certain extent Joe lives within his own head, writing poetry, and his mother is keen to keep him indoors once school has finished because she fears he will be shot as the British soldiers patrol the streets. However, he has made friends with Kathleen, a young English teacher and they meet after school. She encourages his writing, enhancing his escape from reality. But when his brother, Brendan returns home his involvement in the IRA brings Joe back to earth with a sharp shock, as the conflict comes closer to home. Shadows on Our Skin is an engrossing book, the writing is taut and spare and yet poetical, the scenes standing out vividly in my mind. The characters’ interaction is full of emotion, and of tension; their feelings of despair and bitterness are all very evident. The book is certainly an enlightening read for me. I have read a few thrillers about the IRA-Britain conflict, especially through the novels of Jack Higgins. I think the conflict affected most people in Northern Ireland and even those who were not directly involved. This is the first book I’ve read, either fiction or non-fiction on the IRA conflict! I’ll look out for Jack Higgins’s books. I have a feeling I should know Johnston’s name but I can’t think of any of her books that I’ve read. I worked for a time with the nephew of the Catholic priest who had to go and tell thirteen families that one of their people had been killed on Bloody Sunday and the daughter of one the British Army Officers involved. Fortunately, they were never aware of the connection or it could have made the professional relationship difficult. It does mean that this is a topic I’m very interested in, however, so I may well look out for a copy of this. Alex, what a difficult situation! This is only the third book by her that I’ve read – all different issues, but all beautifully written and absorbing books. The Illusionist is the only Johnston I’ve read so far – it seems she excels at shorter novels with her sparse style. I’ll certainly read this one when I spot a copy. Margaret – This sounds like a really personal and fascinating look at that conflict at the human level. Glad you enjoyed the book. Oh Margaret, yet another to add to my list, thank you for your thoughts.